As companies spend considerable coin targeting the independent film community at festivals, others are finding another gathering of tastemakers just as attractive to boost business: foodies. Resort and casino the Cosmopolitan of Las Vegas, which previously backed events like the Sundance Film Festival and AFI Fest, has been touring the country with a two-story mock-up of one of its rooms, nicknamed “the slice,” as part of its sponsorship of Food & Wine magazine’s festivals in Los Angeles; Pebble Beach, Calif.; Aspen, Colo.; and Miami’s South Beach. The Cosmopolitan is now generating heat with its integration into the current season of Bravo’s “Top Chef Masters,” which features the Las Vegas Strip property during the show’s 10-episode run. The hotel’s facade, pools and restaurants, including its Wicked Spoon buffet, Jose Andres’ Jaleo and Blue Ribbon Sushi, are prominently featured, as is its three-story chandelier bar. Bravo hosted the show’s premiere at the site July 25, and business has increased at the buffet since the first episode aired. After passing on the chance to serve as a location for several TV shows, including MTV’s “The Real World,” hotel marketers saw the food show as the right fit. “We couldn’t pass up an opportunity to be part of ‘Top Chef Masters’ when they were considering filming in Las Vegas,” says Lisa Marchese, the Cosmopolitan’s chief marketing officer. And opening its doors to the show actually helped lure the production to Sin City. Marchese has found the food-loving audience just as young, sophisticated and affluent as the indie film community the Cosmopolitan is looking to appeal to. She considers both groups part of “the curious class,” individuals who are open to trying boutique hotels, new food and like to travel. “They’re creative and like to explore,” Marchese says. 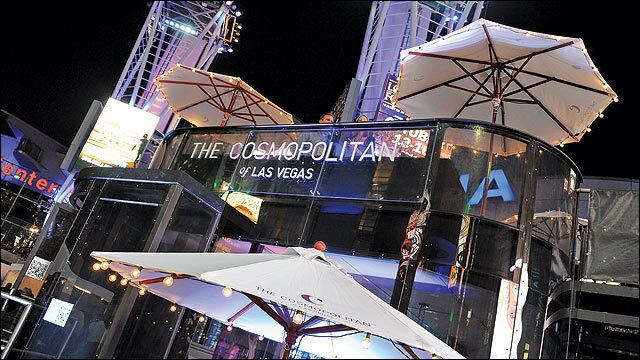 With around 60% of its customers coming from California, events in the state, especially in Los Angeles, have been part of the Cosmopolitan’s marketing plan since the nearly $4 billion resort and casino opened its doors in 2010. The Cosmopolitan’s taste in events may seem like it’s changed it’s marketing focus, but it hasn’t given up on film fests just yet. In June, the 2,995-room property hosted Tropfest, which calls itself the world’s largest short film festival, bringing out Toni Collette, Tobey Maguire, Rebel Wilson Anthony LaPaglia, Griffin Dunne, James Woods, Abbie Cornish, Jason Gann, Rob Corddry and Sundance’s director of programming Trevor Groth to the weeklong event’s first U.S. stop since launching in Australia 20 years ago. The event also kicked off Maguire’s Tropfest/Mobli Micro Film Festival, comprising 70-second shorts. In return, the Cosmopolitan also landed appearances on Starz, Tropfest USA’s broadcast partner, and on the festival’s YouTube channel, which has generated more than 11 million views, with 40% coming from the U.S.